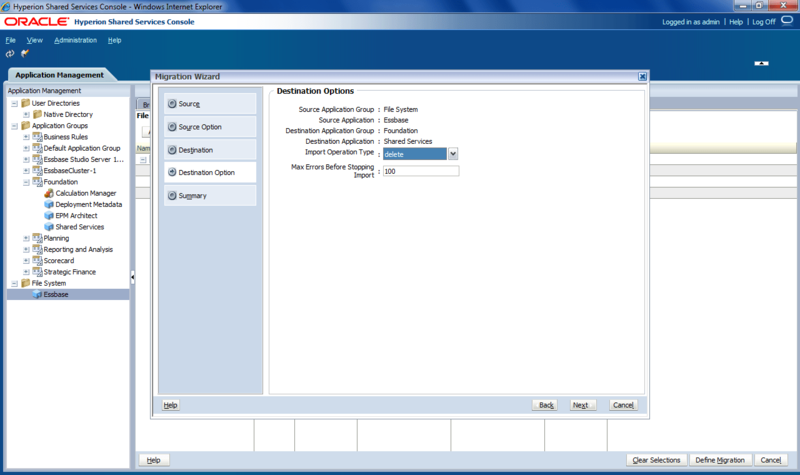 I’ve once talked about adding bulk native users in Hyperion Shared Services using CSSExportImport Utility. This is an attempt to re-visit the same keeping in mind that CSSExportImport is no longer available from 11.1.2 onwards. I believe all of you are aware that Shared Services is no longer using OpenLdap and is replaced with relational databases for more stability. You can check this entry for some information on the internal handling. The challenge in adding multiple users at time (not from front end, where you’ll add users one by one) is to generate the Encrypted password and the internal ID, as both are system generated. I was looking around to find a way out where I had to add 300 users to the system for Performance testing. I tried to find a match for an internal id and then achieved the task by incrementing the internal ids and copying the encrypted password for all the users(as password were same for them). (do not try this, as it is not a recommended way). You can specify the password for a user, you can even add the native user to a group using the below given Maxl. Only issue in doing so is the user will get a default Essbase server access. However you can remove the provisioning using LCM. 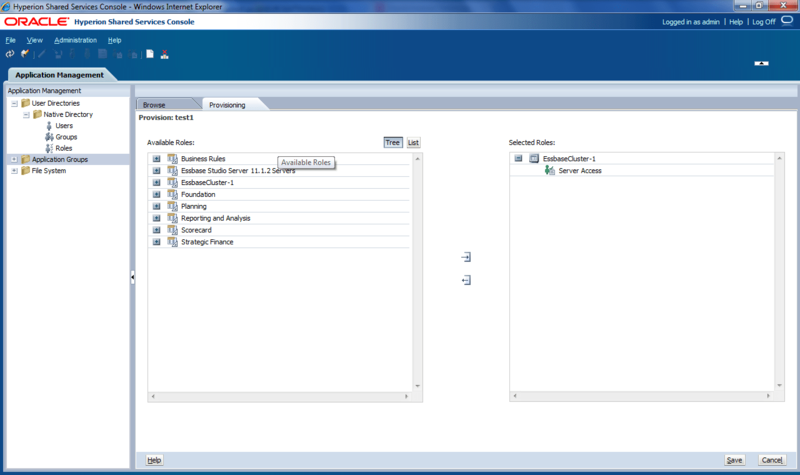 Perform LCM for Shared Services and select Essbase Cluster from the Assigned Roles section. 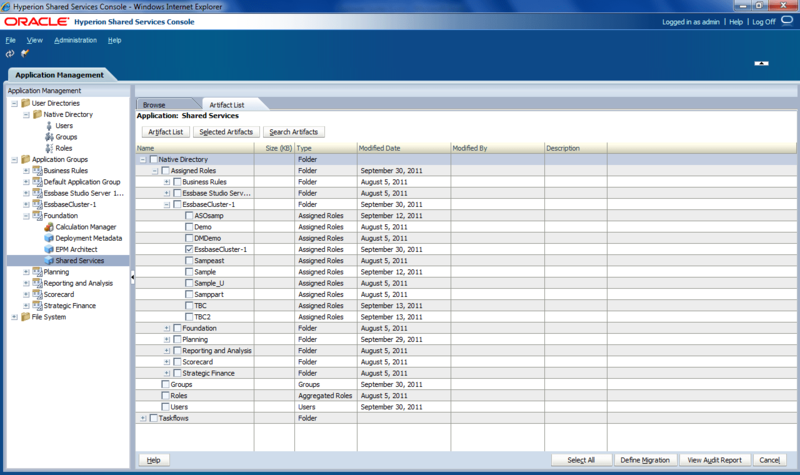 and edit the EssbaseCluster-1.csv file to remove all entries except the newly added user information. This will remove the existing provisioning (Server Access) from all newly added users. Thank you very much for pointing this out Henry Vilminko. You can generate the users by editing csv file (use export for edit option) and follow the below given steps. If you want to create new native users you can just leave the internal_id field empty and HSS will generate a new id automatically. The password can be given in plain text – Shared Services will encrypt it before storing the user in the database. The file shown below will create three new test users in Native Directory when imported through LCM. what about using the Java API of Shared Services? Have any one used Delegated User Management Concept in Shared Services version 11.1.2.2. Below is an JAVA API which can be used to add bulk users (even Active Directory users ) to Native Group in Shared Service . . Thank Celvin for guidance . Java Provision user1 admin password1 "test_native_grp1; test_native_grp1"
Could you publish it please ? i used LCM utility.bat to add external user to group.how ever it overwrites the user available in the system.meaning old users have been removed from the group and newly added user were sitting i the group. is there any way to append it using LCM utility.are they other way to do it?Please let me know. i am in 11.1.2.1.during LCM import i selected "Createupdate"options.the same thing is replicated xml file as well.i don't know bout preference.can you please explain me where i need to find the preference? got registry error while running. Did you go through the link? Right now you cannot automate it, however it allows you to create bulk set of users and groups. Correct me if my wrong.adding bulk users and groups can be done in LCM utility in 11.1.2.1.But how ever is there any automated way to append external directory user (not overwrite) in to native directory group. (JAVA API or some other way). I was able to execute the sample API programs.How ever they have given a method to add native users in to group.But can you please explain me which class and interface need to be used to add LDAP users in to groups.